We review several properties of thermal states of spin Hamiltonians with short range interactions. In particular, we focus on those aspects in which the application of tools coming from quantum information theory has been specially successful in the recent years. 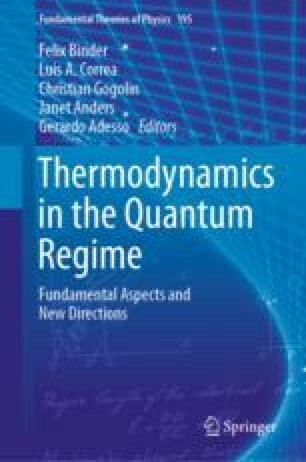 This comprises the study of the correlations at finite and zero temperature, the stability against distant and/or weak perturbations, the locality of temperature and their classical simulatability. For the case of states with a finite correlation length, we review the results on their energy distribution and the equivalence of the canonical and microcanonical ensemble. We would like to thank C. Gogolin for helpful comments. The work of MK was funded by the National Science Centre, Poland within the project Polonez (2015/19/P/ST2/ 03001) which has received funding from the European Union’s Horizon 2020 research and innovation programme under the Marie Skłodowska-Curie grant agreement No 665778. AR acknowledges Generalitat de Catalunya (AGAUR Grant No. 2017 SGR 1341, SGR 875 and CERCA/Program), the Spanish Ministry MINECO (National Plan 15 Grant:FISICATEAMO No. FIS2016-79508-P, SEVERO OCHOA No. SEV-2015-0522), Fundació Cellex, ERC AdG OSYRIS, EU FETPRO QUIC, and the CELLEX-ICFO-MPQ fellowship.